I don't know about you but there are definitely times when I struggle to think of things to with my children, especially when the weather is cold, wet and windy and your stuck indoors. We always end up doing the same things, watching a DVD, baking cakes. Don't get me wrong, we always have fun but sometimes it is nice to find other activities to do and that is where Weekend Box can help. Weekend Box is a new company that deliver activities for 3-8 year olds right through your door. Each box contains something to eat, something to make, something to explore and something green. And because they fit straight through the letterbox, you don't have to worry about being in for delivery. I loved the concept straight away, it means you can get on with having fun with your kids without the stress of thinking of the activities first. When you subscribe, you pay £7.50 per box and you get a box delivered every fortnight and with the box containing 4 activities, it means you can choose 2 to do each weekend. The first activity we decided to do was make a pair of 3D glasses. The girls took in turns to do the sticking, cutting and colouring. The only problem we found was that the glue had leaked slightly but no damage was done. You can see from the pictures that the girls really enjoyed making the glasses and how cool did they look with the finished product on!! Again a simple activity that we all worked on together, mixing, grating etc. We added in some sausages to make it look like stepping stones to get on and off the boat. Dinner was eaten very quickly, I especially loved the mixed herbs that we were given to add into the potato mix. Last weekend we did our final two activities. First task was to make a bird feeder. The girls shared out which part they would do and Elise read out the instructions making sure that they followed them correctly. It was nice explaining to Gracie just what we were making and what it was for. We placed the bird feeder out on our garden fence, the girls now keep peeking out of patio doors to see of they can spy any hungry birds. The final activity was something that I used to enjoy doing as a child, sand art. With lots of different colours of sand included and two pictures for them to colour in, the girls started on creating some works of art. The only problem we had was that their baby sister wanted to join in and I didn't think it was good idea letting her eat sand!!! When they had finished with the pictures that Weekend Box included, they got some more paper and started making pictures of their own. 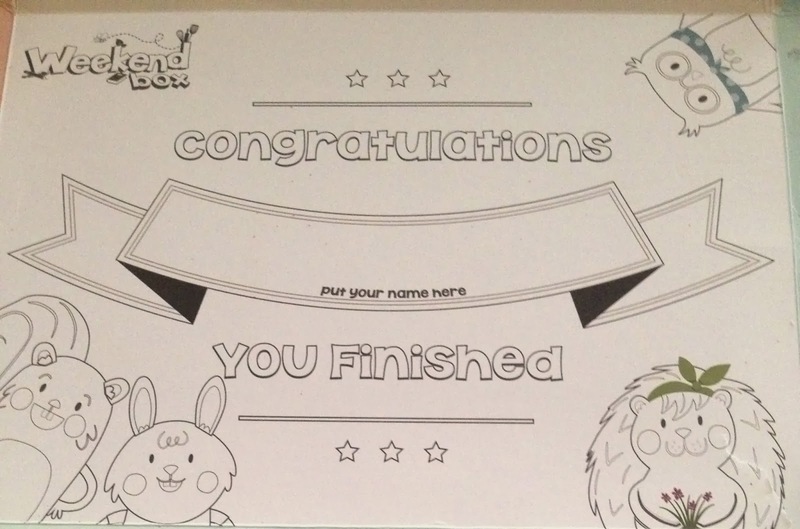 At the end of each activity there a sticker included to stick on the activity sheet to show that you have completed the task and when you open up the weekend box itself, there is a certificate for little ones to colur in inside, nice little reward at the end!! The girls and I really enjoyed our weekend box and when you break it down it is only costing you £3.75 a week, when you sign up you pay just £5 for your first box, now that is a bargain my eyes. Of course if you have plans over the weekend you can always use the weekend box for after school activities. I like the fact that whilst the girls were having fun, they were also learning at the same time. Disclaimer : I was sent a weekend box free of charge for reviewing purposes however all thoughts and opinions are my own. What a fab box, lots to do, a great bit of education in some parts, and a stress free time, not having to come up with ideas to entertain. Looks like they had great fun. I popped over from Family Fever. Looks like you all had fantastic fun!! We loved our weekend box!! Foodstuff distribution companies Healthy Food Delivery tend to be an incredibly beneficial organization, tend to be an incredibly beneficial organization,you will need to guide through the kitchen's along with face other sellers. Opposition can be so that, in fact, there is absolutely no place in this organization that is low compertition.